Images say more than thousand words. You may know this when adding a Feature Image to your posts but now you can do this for your newsletter campaigns too. 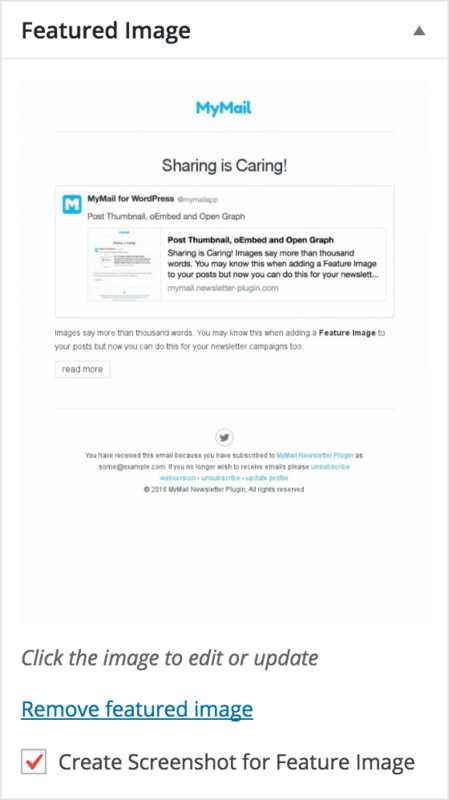 You can now add a feature image to your newsletter campaigns directly from the editor. This works like on regular posts by selecting one image of your media library. If you don’t have a proper image tick the “Create Screenshot for Feature Image” checkbox and Mailster will generate a screenshot of you campaign as soon you save it. Post Thumbnails is a WordPress native feature so you can do all thinks you can do with images from other post types. WordPress 4.4 has become a oEmbed provider. oEmbed let you embed content from different sites like Twitter, Flickr or Youtube. Now you can embed campaigns on another site which can discover oEmbed content (like another WordPress site). This only works if your Mailster installation is enabled on a WordPress site with version 4.4 or above! Mailster Newsletter Campaigns now look better if you share them via Facebook, Twitter , Google+ or other social sites.